With first rate performances from an A-list cast, the handsome period piece The King's Speech is one of the most accessibly entertaining films of its kind in years. Colin Firth plays England's King George VI (father of the current Queen Elizabeth) who must overcome an embarrassing stutter in order to lead his country through the trying times of World War II. Geoffrey Rush is the Australian speech therapist that gives George strength and training; as a result a lifelong friendship develops between the two. This inspiring and beautifully told tale should have upscale fans of fine drama lining up for its Thanksgiving holiday release, with wider commercial crossover prospects once award nominations start rolling in (an inevitability especially with Oscar-hungry Harvey Weinstein leading the charge). Prince Albert (Firth) suffers from a major speech impediment and wishes to stay far from the spotlight. Fortunately his brother, Edward (Guy Pearce), is happy to hog the attention, and looks to be the natural successor to his father, King George V (Michael Gambon), until he rather famously abdicates for the "woman he loves," Wallis Simpson. Edward's abdication clears the way for the reluctant man who would be king. 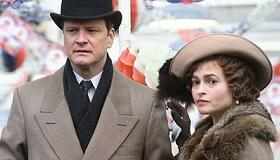 Albert's wife, Queen Elizabeth (Helena Bonham Carter), buys the services of an unorthodox Australian speech therapist, Lionel Logue (Geoffrey Rush), and the men form an uncommon bond as Lionel and Bertie (as he calls Prince Albert) go to work using Lionel's unconventional methods to prepare him for the brave new world of radio addresses; a necessity as the world prepares to go to war and the newly crowned King George VI will have to deliver authoritatively—and without a stutter. The bulk of the film becomes a relationship testing the determination of a frustrated King to overcome his handicap, and his trainer's go-for-broke, highly improper methods, all set during a very important time in the history of England. Director Tom Hooper and screenwriter David Seidler have crafted a literate, funny and ultimately touching story that, at its heart, is really about friendship. In a genre of stuffy English period pieces, The King's Speech stands out as something to which everyone could relate. Credit for this goes in large part to the meticulous casting, particularly in leads Firth and Rush who play beautifully off each other. Firth, as he did last year with his Oscar nominated A Single Man, again proves he is almost without peer among contemporary British actors, as he takes on the extremely tricky task of playing a monarch with a severe stutter and not making his character seem cartoonish or, worse, disrespectful. Rush is the perfect counterpart; a take-no-prisoners coach who demands to be on a first name basis with his student and treats him without any special consideration for who he is. These are two of the finest performances in this—or any—year and they are well-supported by Gambon, Bonham Carter, Timothy Spall as Churchill, a wonderful Derek Jacobi as Dr. Cosmo Lang and Jennifer Ehle as Logue's confused wife (who is just terrific in a scene where she unwittingly meets the King and Queen of England unannounced in her living room). The King's Speech is a magnificent movie treat, one of the very best pictures of the year and one so engaging and enlightening that it just may become a box office surprise once word of mouth hits the street. Release date: November 24 ltd.